The easy-to-use Porcelaine 150 markers let you decorate your dishes, vases and other projects in bright, cheerful colors. Porcelaine 150 can be applied to all heat-stable bases that are able to withstand a temperature of 300¢X F (150¢X C), such as porcelain, china, glazed earthenware, terra cotta, metal, enameled sheet steel, copper and glass. After being baked in a traditional oven, your art becomes permanent- even through washing! Vitrea 160 is made to be applied to glass or crystal pieces. The glossy or frosted appearance of the colors provides an infinite variety of effects, taking full advantage of light and shadows. After baking, colors are exceptionally intense and glass seems to be body-dyed. A new oil-based paint marker line, the 4ARTIST markers are great choices for fine & graphic arts, mixed media, and more! 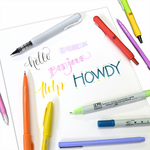 Available in 4 tip styles and a variety of vivid, opaque colors- including some impressive metallics.